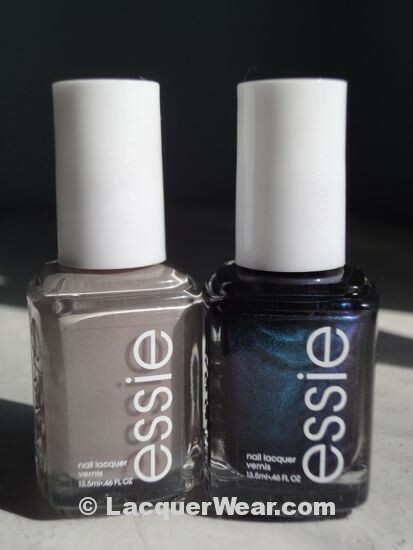 To finish up my recent Essie binge, I have swatches of two retail-only Essies: Dive Bar and Master Plan. These are new colors that are only available through the new Essie retail displays, or online through the retailers that have the displays, like WalMart and WalGreens. It took some perserverance, but here they are! I went to many stores looking for this first polish, Dive Bar. It’s a very dark, moody blackish teal, with lots of shimmer. It was not out in the WalGreens displays when I was looking, but it looked like the displays were still being filled in, so it might be popping up more now. But it’s a great color, so it wouldn’t surprise me if it’s often one of the first to sell out of a display. This picture shows three coats, and you can kind of see the purple tone it takes on in some lights, up by my cuticles. It ends up looking really dark, but when the light hits the shimmer it has a nice, bright blue shine that peeks up. It’s very lively for a dark color like this. This picture in the shade shows how it can look dark and navy when there’s no light to pick up the shimmer. The shimmery finish reminded me of China Glaze’s Vintage Vixen collection from the fall, so I checked to see how close it is to Emerald Fitzgerald, which always surprises me by seeming darker than I remember it. Emerald Fitzgerald is the lighter of the two, but you can see that they’re a little bit close. Next to Emerald Fitzgerald, Dive Bar looks more blue and purple. But both of these polishes are blackened and dark where the light doesn’t pick up their shimmer. The other retail-only shade that appealed to me was Master Plan. It’s a warm, brownish grey. I think I’m getting too many of these colors, but they’re so pretty that I have a hard time resisting! It applied easily but took three coats to be opaque for me. I wanted it partly because I had read speculation that it was very close to Waking Up in Vegas by Deborah Lippmann, so I had to check. In the picture above, I have Master Plan on my index and middle fingers and Waking Up in Vegas on my ring and pinkie fingers. The colors are really close, but Waking Up in Vegas is a hair more yellow and warm. The application is a little better for me on Waking Up in Vegas, so if I had to pick just one I would pick the Lippmann. But these are so close that this Essie is a nice substitute if the mood strikes while you’re buying contact solution. And the Essie is half as much, not even counting shipping costs. Thanks! That’s nice to hear! Master Plan is a pretty color, it would make a great substitute for Waking Up in Vegas. This is my favorite blue/green ever! Just found it a week ago at rite aid and I am soooo glad I did! Beautiful dark polish for fall/winter!